MySlideShow Gold v3.6.0.249 contains web gallery fixes for Internet Exploror 11. Download link. MySlideShow Gold v3.6.0 has been released. Its new slide show engine plays the motion (pan and zoom) effects. Read more. The Glider plug-in is a slide show player that supports the motion or pan & zoom effects. After installing it's accessible as the Tools | Glider menu or toolbar button. You can download the plug-in from the Download page. This article may help you understand different slide settings and explains how to change them for a group or all your slides. Read more about the slide settings. MySlideShow v3.4.3. Output web galleries can be viewed in Internet Explorer 9. MySlideShow v3.4 has been released. This version has a new slide previewer and the Search & Fix tool that fixes broken links in your projects. Read more. MySlideShow v3.3.4 has been released. Minor fixes and cosmetic changes mostly. The Silverlight Gallery plug-in now supports the SlideShow and PhotoTable templates. The Video Codec Pack for MySlideShow Gold supports .mov movie/video clips recorded by modern Canon photo cameras. MySlideShow v3.3.2. The Timeline view of the Slide List now displays the Sync playlist that helps you synchronize groups of slides with audio tracks. Silverlight Gallery plug-in for MySlideShow is available. This plug-in is a good replacement for HTML web galleries. Read more about web slideshows with music. MySlideShow v3.3 has been released. You should install a separate Video Codec Pack to use embedded video clips in your slide shows. Read more. MySlideShow v3.0.2. The Volume sliders are moved from the Project Settings window | General tab to a separate window. The Sync and Background Playlists now have their own volume sliders. MySlideShow v3.0.1. This update allows you to select the monitors where you want to play slide shows and place the thumbnail/navigation panel. For example, you can play your slide show using a projector and place the floating thumbnail/navigation panel on the laptop screen. MySlideShow v3.0. We are pleased to announce that we have released MySlideShow v3. In addition to the Details view, this version contains the Thumbnails and Timeline views on the main screen. You can use semi-transparent colors and shadows for captions, display a thumbnail panel during the slide show and add silence intervals to the playlists. To open the revision history page, click here. Flash Gallery plug-in for MySlideShow. This plug-in can create a Flash web gallery from your slide show project. Then you can upload the output folder (containing HTML page, SWF files, images and a music file) to your website. After installation the plug-in is accessible from MySlideShow's Tools | Flash Gallery menu. Download. DVD Album v1.0 released. 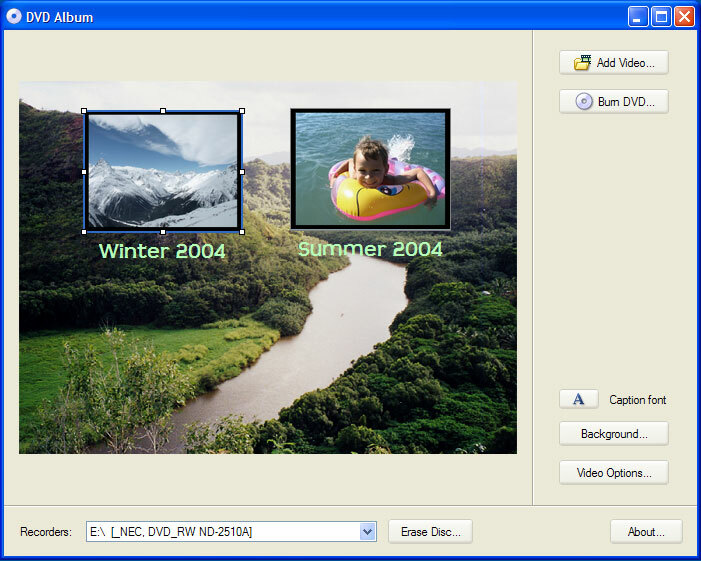 This free utility allows you to add several DVD .mpg video files (created by MySlideShow), create a simple menu (change menu thumbnails and captions, select the background picture) and then burn a video DVD. MySlideShow v2.5. We are pleased to announce that we have released MySlideShow 2.5. Since this version the product is available in two editions: MySlideShow and MySlideShow Gold. The Gold edition includes the Slide Editor add-in and a new Timeline Editor that allows you to define custom slide transition points on the background playlist timeline. MySlideShow v3 always synchronizes slides with the Sync Playlist (accessible by the Sound button). The best way to make a custom synchronization of your slides with audio is to use the Timeline Editor included in MySlideShow Gold. To open the Timeline Editor, select the Timeline tab of the Slide List. There you can define slide transition points on the timeline of the Sync Playlist. The Timeline view allows you to play the music, drag slides on the timeline or select a slide group and automatically allocate them on a part of the timeline (for example: a song in the playlist). The synchronization options and Timeline Editor allow you to create a slideshow which advances the slides in the same points in the preview/.exe mode and output video files or DVD discs. The best parental control and employee monitoring program. Hoverwatch app has recently been named the best multi-device monitoring software. It allows you to monitor Android, Windows and Mac devices' activity. Considering the explosive growth of Android popularity this direction seems to be the most promising one to follow. This slideshow software allows you to create and play slide shows on your PC and DVD player. Groups of images (with corresponding sound/music files) can be viewed sequentially on your monitor as a slide show. You can view your photos as a filmstrip or thumbnails. Several slide shows can be combined into an album. The program allows you to add captions and background music and set transition effects. When you are satisfied with the structure of your slide show, you can create a standalone executable slide show or encode video files in different formats (VCD, SVCD, DVD, WMV, AVI/DivX). You can also burn an autorunnable PC CD, Video CD or DVD (for home DVD players) and send it to your contacts. When they insert your slide show CD into their CD-ROM, MySlideShow player will automatically play the slideshow you have created. That's not all: you can create a Web Gallery (HTML pages with thumbnails and full-size pictures) from your slide show project and then publish it on your web site. MyWebGallery allows you to create web galleries and slide shows (HTML pages with thumbnails and full-sized images). Images may have captions. You can preview web galleries in the design mode, then save them to the hard drive and upload to your website. The program contains several gallery styles. New styles can be added or edited by users. PicViewer is an image viewer for most common file formats. PicViewer displays images in the following formats: BMP, ICO, CUR, ANI, WMF, EMF, GIF, JPEG, PNG, PCX, TIFF, PSD, FlashPix(FPX), PCD, icons from EXE, DLL, ICL files. Additional plug-in viewers display HTML pages and play different audio and video files (WAV, MP3, WMA, AVI, MPEG, ASF and others). Features: clean and easy-to-use interface, thumbnail mode, slide show, image file name as command-line parameter, prints images and thumbnails with print preview, supports animated GIFs, Windows ANI files and multipage TIFF images, bookmarks, file operations, build-in image converter, fullscreen mode, file filters, Wallpaper operations, contains powerful GIF inspector, and more. The program (v3) is free. The DVD Album utility allows you to import several DVD .mpg video files created by MySlideShow's Tools | Video menu, create a menu (with additional text boxes and background music track) and burn a DVD video disc or save DVD disc files to the hard drive. The utility is free. HTML-View is a viewer/offline browser for WWW file formats. Features: browse by file, file name as command-line parameter, file and folder bookmarks, supports animated GIFs, search in files, file operations, multilanguage support, and more. Do you love taking lots of digital photos? Use SnapTouch to touch up and arrange them in a snap! The main program features include: smart file importing and renaming, creating collections and batch processing, date and time stamping, removing the red-eye effect, cropping while maintaining proportions, viewing EXIF, adding comments, supporting of localizations and skins.